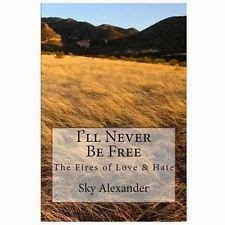 The first book in a four-part historical-romance series, “I’ll Never Be Free - The Fires of Love and Hate," by Sky Alexander, tells the story of how a strong woman deals with an unwanted arranged marriage in nineteenth century America. The 460-page novel, inspired by the author's family stories, is set in small-town Missouri, when the state's biggest wedding is about to take place. The bride-to-be is the strong-willed Hattie Morran, whose poor father has offered her to be married to the cruel Abner Garland as payment for gambling debts. Although Hattie is furious she is forced to marry someone she hates, she plans a way to gain the upper hand in the situation, which eventually results in her becoming extraordinarily wealthy. In addition to the interesting plot, "I'll Never Be Free" has a few underlying themes, the main ones being optimism, perseverance, and faith. One of the strengths of the novel is the interesting dialogue, which is both engaging and realistic. The highlight of the novel is its cast of strong female characters. Regardless of the trials set in front of them, they remain determined and optimistic. Overall, the book is an inspiring, interesting read that is perfect for anyone interested in the historical-romance genre -- and fortunately for the fans, there are more books in the series to look forward to.